Due to limited resources and a rising demand, patients will be seen based on severity of condition. We are currently working to lower our costs and improve clinic flow in order to accommodate our growing patient population. Please bear with us as we work to increase our capacity to serve the uninsured of Lubbock. Free vaccines available at The Free Clinic now! Flu shots for adults and children 12+. We are now providing select free vaccinations at The Free Clinic. Stop by any 3rd Wednesday of the month from 3:00 - 5:00 PM! Please join us in welcoming and congratulating the new faces of the clinic. We look forward to watching the clinic succeed under their talented leadership. 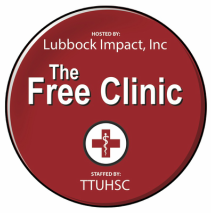 We are so excited to see these gifted leaders continue to excel in the mission of the The Free Clinic. It will be an honor to watch them serve the community of Lubbock while enhancing TTUHSC medical student education over the next year.